Multi Grater has a lot of the features of an electric food processor but is manual, not needing electricity if you are green or off grid. You have the discs you expect, six of them to swap out for vegetable preparation, dicing , making fruit slices, even grating chocolate, cheese and nuts. 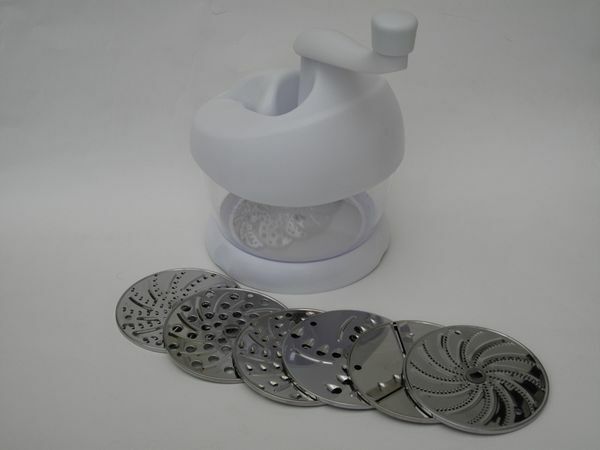 The cutting discs are stainless steel so will not rust and clean up easy in the sink (or dish washer). As befits a multi tasking bit of kitchenware as well as having six functions with those 7 in x 8 in (17.8 cm x 20.3 cm), you can use the 19cm body as an attractive, clear salad bowl. Made from food grade ABS and stainless steel, Multi Grater should give years of service in your home or off grid in caravans, mobile homes, etc. Multi Grater text, images and video are copyright.